What better way than to celebrate this month dedicated to the rich culture of black people. The NAACP was formed in 1909 by whites and blacks who wanted to see justice in America. It is not just black history, it is America's history. 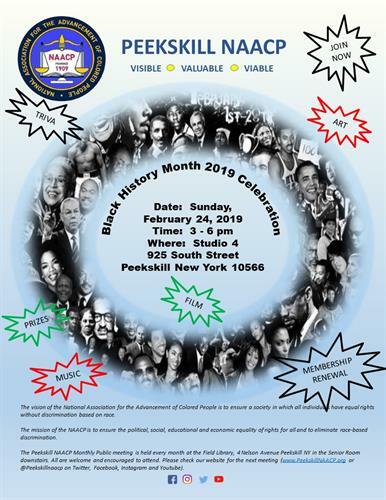 The Peekskill branch consists of the same types of people --- CHAMPIONS FOR CHANGE and recognizes that our community has a lot of history and has people of all races, creeds and religions like those that formed the NAACP in 1909. Meet our members, cultural artist, Bria the Artist and have a little fun learning about our history. Perhaps you too can join the ranks of champions for change! LIGHT REFRESHMENTS WILL BE SERVED.